The artist's studio stamp (L. 604). Matilde Vallet, Paris, Drouot, 30 March 1927. with Durand-Ruel, Paris and New York. with H. Brittner & Co., New York. A. Dohme Breeskin, Mary Cassatt, A Catalogue Raisonné of the Oils, Pastels, Watercolors and Drawings, Washington, 1970, p. 250, fig. 721. N. Mowll Mathews, Mary Cassatt, New York, 1987, no. 29. G. Pollock, Mary Cassatt, London, 1998, p. 145, fig. 104. A.M. Reitlinger, Paris, 1931, no. 165, illustrated. Paris, Musée Marmottan, Les Femmes Impressionistes, 1993, no. 14. 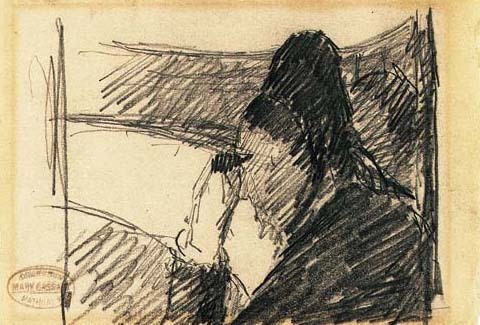 The drawing is a study for the picture of the same title, dated about 1878, that is now in the Hayden Collection in the Museum of Fine Arts, Boston. Two other studies are also in Boston, A. Dohme Breeskin, op.cit., nos. 719-20. The subject, a woman intellectually absorbed in the performance at a Sunday matinée, as indicated by her black daytime clothes, was one of the first of many of similar subjects in Cassatt's work between 1878-1882, when she produced most of her great theatre scenes, G. Pollock, Mary Cassatt, Painter of Modern Women, London, 1998, p.145, pl. 104. None of Cassatt's sketchbooks survives, but it is evident from studies such as the present sheet and the related Boston drawings that many of the artist's individual sketches were made on sheets from the sort of pocket-size sketchbooks used by Degas and other artists of the Impressionist circle, N. Mowll Mathews, op. cit., under no. 30.